Most people are aware that someone who is strong and fit often looks much younger than someone who has let go. There’s a reason for that. A recent study performed at the University of California San Francisco and the Preventive Medicine Research Institute found that our genes are not our destiny. What this means is that lifestyle changes can and do change how our body ages. For the first time researchers have produced preliminary evidence that supports the case for practicing a wellness lifestyle. This exciting discovery suggests that exercise may be the key to longevity. Inside the nucleus of each one of our cells the genes are arranged along twisted, double-stranded molecules of DNA called chromosomes. At the end of these chromosomes are stretches of DNA and these are the telomeres (often compared with the plastic tips on shoelaces). These act as caps to keep the sticky ends of chromosomes from randomly clumping together which would inhibit the expression of genetic information. Along with protecting our genetic data these “caps” make it possible for cells to divide and evidently hold some of the secrets to how we age and get diseases. 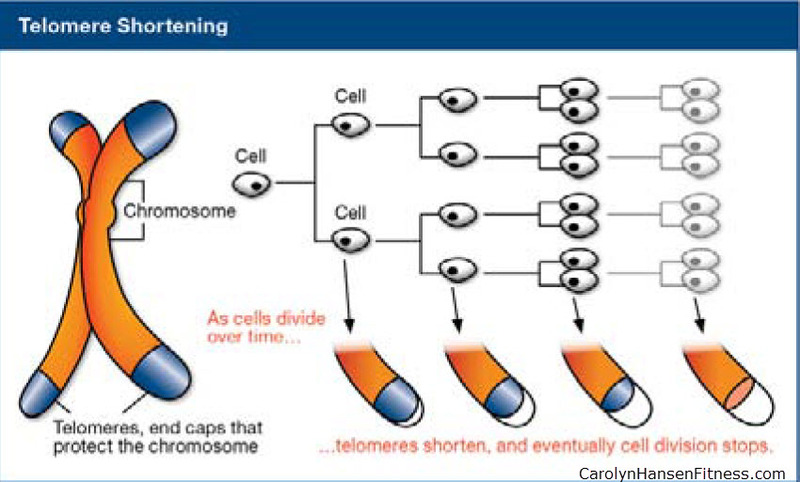 Each time a cell divides, the telomeres get shorter. This shortening process is associated with aging, cancer, and a higher risk of death. 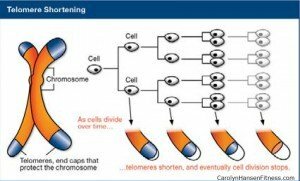 Telomere shortening is now thought to be a major key that explains the process of aging itself and hold the promise of not just slowing aging but potentially reversing it. Science is revealing that many types of health problems can be reversed by restoring and “rebuilding” your telomeres. Thus, their length is considered to be a marker of aging and health. Doing the correct type of exercise regularly can make you younger in many ways, in part because it affects your DNA – those telomeres, the tiny genetic “clocks” that tell cells how old they are. Truth is, lifestyles are the key to speeding up or slowing down telomere shortening. Poor nutrition, lack of exercise, stress, and insufficient sleep all cause production of free radicals that can significantly speed up the telomere-shortening process. Shortened telomeres force inefficient gene function that locks into place problems involving inflammation and immune cell aging which drive the rate of aging and risk for diseases. Eventually your DNA becomes damaged beyond your body’s ability to repair it; and once your biological processes fail, you die. A study involving 35 men in their 50’s and 60’s found that the 10 participants who adopted several healthful lifestyle changes for five years experienced a 10 percent lengthening of the cell’s telomeres indicating that the cells would have a longer lifespan. From observation, it has been determined that active people tend to have longer telomeres. Imagine being able to slow or even stop or reverse the damage done by aging. That would be the true Found of Youth, found right within your own body where you have access to it. Telomere shortening is not only a marker of cellular aging related to body health, but also to healthy brain function with a direct correlation observed between short telomeres and degenerative brain diseases like Alzheimer’s and dementia. Only you have the power to affect the rate of shortening of your telomeres. It is you and you alone that can stop these tiny entities from being shortened by stress, insufficient nutrients and processed foods laden with trans fats and other harmful chemical additive along with other damaging lifestyle choices…alcohol, drugs (whether prescription or recreational), overindulging in foods…especially the wrong kinds and leading a sedentary life. Without a doubt, the best way to preserve your health and lay the foundation for a younger body is by protecting your telomeres and you do that by shifting to a healthy lifestyle…both diet and exercise.